Studio SOS articles are typically hosted by Paul White and Hugh Robjohns, who travel to the far corners of England in search of chocolate Hob-Nobs and studio spaces needing help. Alas, however, I couldn't talk them into driving to Colorado when I was embarking on a home studio upgrade. Instead, I had to read a number of their columns, search for some online advice, and carry out my own experiments with room modes, acoustic treatment and speaker settings. And the results were well worth the effort! As many of you may find yourself in a similar situation, I'll describe the room I had to work with, show initial measurements I made before any treatment, and then the final (at least, the most recent) results. I started with a basic 'box' room, about the worst possible shape, with equal width and length and a height only slightly shorter. This is the kind of space that many feel cannot yield good acoustics, but there are a number of techniques to alleviate the potential issues that such a room promotes. My room is approximately 3.6 metres (12 feet) on each side and about 2.6 metres (8.5 feet) tall. The walls and ceiling are plasterboard, and the hardwood floor is carpeted. Originally the room was used for video editing, and acoustics were not a concern since I was using headphones when working on video. These days I use the studio primarily for mixing and mastering, with some audio recording, such as vocals and guitar. For mixing and mastering I want absolute clarity, a smooth monitoring frequency response, and minimal contribution of reverberation from the room. 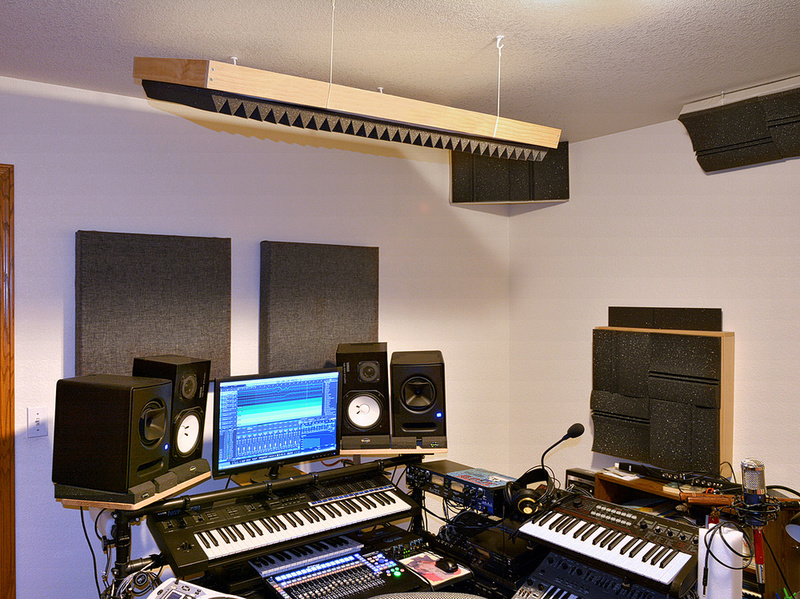 The original upgrade project was started about six years ago, and for this article I wanted to illustrate how the room sounded before I added any acoustic treatment, but it took considerable time searching through my audio PC to find my original test files! I found a 20Hz-20kHz test result that shows rather wide swings with peaks and dips that span over 20dB within a single octave. In Screen 1 you can see a plot I made from this data using Voxengo SPAN (a wonderful free spectrum analyser that you hopefully already have). While a 1dB change is difficult to detect by ear in most cases, and 3dB is detectable but mild, a 20dB change (a 100:1 change in power) is extreme!